South Carolina Gov. Nikki Haley appointed Rep. Tim Scott to be the replacement for outgoing Sen. Jim DeMint. The move was highly anticipated since DeMint announced that he would be departing the Senate on December 6th. Scott, a Tea Party favorite, will bring a strong message of conservative principles to the Senate; one that is centered around limited government, lower taxes, and free enterprise. Prior to being elected to the House of Representatives in 2010, Scott worked at an insurance company and was also involved with real-estate. He served on the Charleston City Council in 1995 and was selected to be the statewide chairman of the late Sen. Strom Thurmond’s senatorial campaign. He is a staunch believer in school choice and tuition vouchers, both are strong assets to his conservative credentials. Scott is now the lone African-American in the Senate. He is the first black Republican Senator since Edmund Brooke in 1979 and first Republican Senator in the South since Reconstruction. While the mainstream media has long attempted to label the Tea Party and Republicans as “old, rich white men” and “racists,” Tim Scott debunks that liberal myth. He broadens the GOP’s appeal and brings a sense of leadership that Washington so desperately needs. In retrospect, the Tea Party is to thank for the diversity and appeal that is attributed tot he modern-day conservative movement. It produced victories for Hispanic New Mexico Gov. Susana Martinez, newly-elected Hispanic Sen. Ted Cruz, and the well-known Cuban-American, Florida Sen. Marco Rubio, who is rumored to be one of the favorites to occupy 1600 Pennsylvania Avenue in 2016. While it is typical of the left to invoke a senseless notion that black conservatives are less authentic for their stances and beliefs, it is important that the narrative be centered on true substance: jobs, growing the economy, and strengthening the middle class. 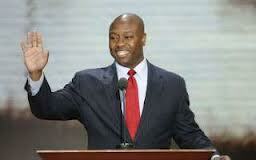 Tim Scott is not only a symbol of racial progression and diversity, but he embodies the American dream. He is someone who came from very humble roots, experienced many challenges along the way but with hard work and dedication has become a powerful voice for liberty. He will be positive force in the United States Senate. Interesting how the left is the side who continues to bring race to the fore, and how the right is the side who promotes based on merit, blind to ethnicity or color. Why, in this day and age, should skin color be of any significance — especially when opportunity is granted to someone who is black?